I was quite pleased when this bunch of bananas arrived the other week. 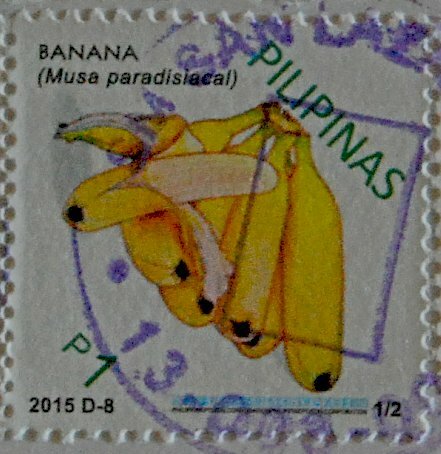 Bananas and Plantains are grown in every humid tropical region and are the 4th largest fruit crop of the world, following the grape, citrus fruits and the apple. Apparently, they were known as far back as 300BC in the Mediterranean. Also, it is a banana plant, not a tree and is a large herb, with the banana itself being botanically a berry. (so say several sources, no matter how strange it sounds). The plant may grow as large as a tree, but what looks like a stem is actually large leaf stalks. It was obviously a watermelon... and some other melon that I can't quite identify (it may be a European cantaloupe which seems to have a different skin than what I am familiar with - ours is a rough netted skin as opposed to a ribbed skin). and tucked in the back are some large figs. This was a confusing stamp as it is listed as being part of a series of stamps for 'the month in folk art'. There are twelve stamps in the series designed by Aleni Apostolou, each one representing something particular to that month. This one is for August, which after seeing the other months, makes more sense to me than some of the 'folk art'. Anyway, figs ripen from mid-August through September and I am sure taste far superior to any grocery store bought figs in North America. I've never been to Greece and would not have associated watermelons with that part of the world - but it seems it is a popular dessert item and also a fruit that comes into season in August. 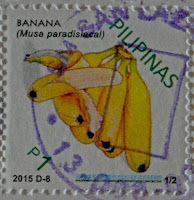 Great stamps - particularly for the summer. 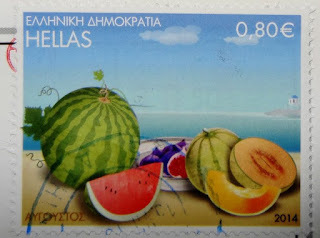 I guess the Greek stamp would have been good for next week's theme, too! These make up a wide selection of fruit we've seen this week. Lovely post. Those summer fruits make me long for the warmth. It think the right hand one is almost certainly what we call a rock melon. It has a netted skin, and the lines as well. Such a delicious, almost perfumed, flesh.